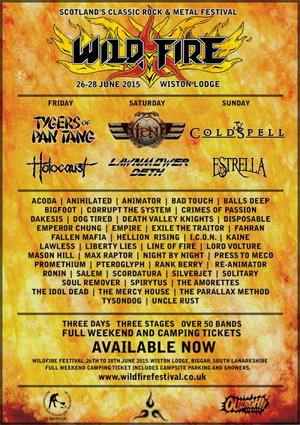 British melodic hard rock giants TEN have been confirmed as the headliner of this year’s WILDFIRE FESTIVAL, set to take place June 26-28, 2015 at Winston Lodge, Biggar, South Lanarkshire, Scotland. The festival will feature performances from the following bands: TYGERS OF PAN TANG, COLDSPELL, HOLOCAUST and ESTRELLA, to name only a few. This is the first Scotland live appearance of TEN since 2002 and their ‘Far Beyond The World‘ UK tour. TEN recently released their new album Albion on November 21st, 2014 via Rocktopia Records.